Thanksgiving is always a conflict for me on the food front. I want to keep things traditional but yet I want to try new recipes and start new traditions. Last year I was dead set on lamb roast instead of turkey which was a good call. This year my bro-in-law suggested capon to replace the turkey. Capon is just a glorified chicken so yeah, it tasted like a great roast chicken. 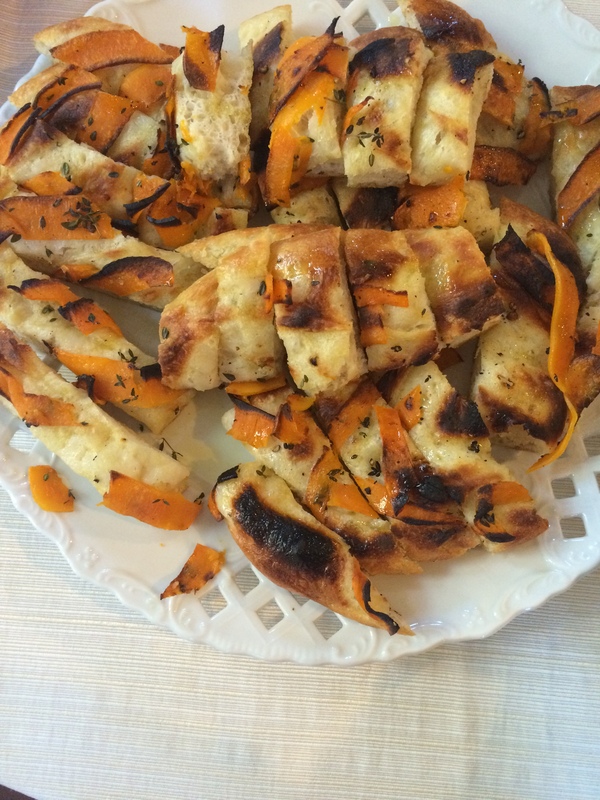 Appetizers is kind of an area that’s free range on Thanksgiving so I decided to make Foccacia with Roasted Squash inspired by the feature in Food and Wine magazine last month. However when it comes to baking bread I often visit America’s Test Kitchen for a bit more education therefore the recipe below is a hodgepodge of the two. The process of making focaccia is a bit more arduous then I remember but oh boy does it deliver. Light and airy with tons of flavor and moisture. You could put just about anything on top of focaccia and it would be great. Stay tuned for my dessert masterpiece. Sliced up ready to eat! 2. FOR THE DOUGH: Stir flour, water, and yeast into biga with wooden spoon until uniform mass forms and no dry flour remains, about 1 minute. Cover with plastic wrap and let rise at room temperature for 15 minutes. 3. Sprinkle 2 teaspoons salt over dough; stir into dough until thoroughly incorporated, about 1 minute. Cover with plastic wrap and let rise at room temperature 30 minutes. Spray rubber spatula or bowl scraper with nonstick cooking spray; fold partially risen dough over itself by gently lifting and folding edge of dough toward middle. Turn bowl 90 degrees; fold again. Turn bowl and fold dough 6 more times (total of 8 turns). Cover with plastic wrap and let rise for 30 minutes. Repeat folding, turning, and rising 2 more times, for total of three 30-minute rises. Meanwhile, adjust oven rack to upper-middle position, place baking stone on rack, and heat oven to 500 degrees at least 30 minutes before baking. 4. Gently transfer dough to lightly floured counter. Lightly dust top of dough with flour and divide in half. Shape each piece of dough into 5-inch round by gently tucking under edges. Coat two 9-inch round cake pans with 2 tablespoons olive oil each. Sprinkle each pan with ½ teaspoon kosher salt. Place round of dough in pan, top side down; slide dough around pan to coat bottom and sides, then flip over. Repeat with second piece of dough. Cover pans with plastic wrap and let rest for 5 minutes. 5. Using fingertips, press dough out toward edges of pan. (If dough resists stretching, let it relax for 5 to 10 minutes before trying again.) Using dinner fork, poke surface of dough 25 to 30 times, popping any large bubbles. 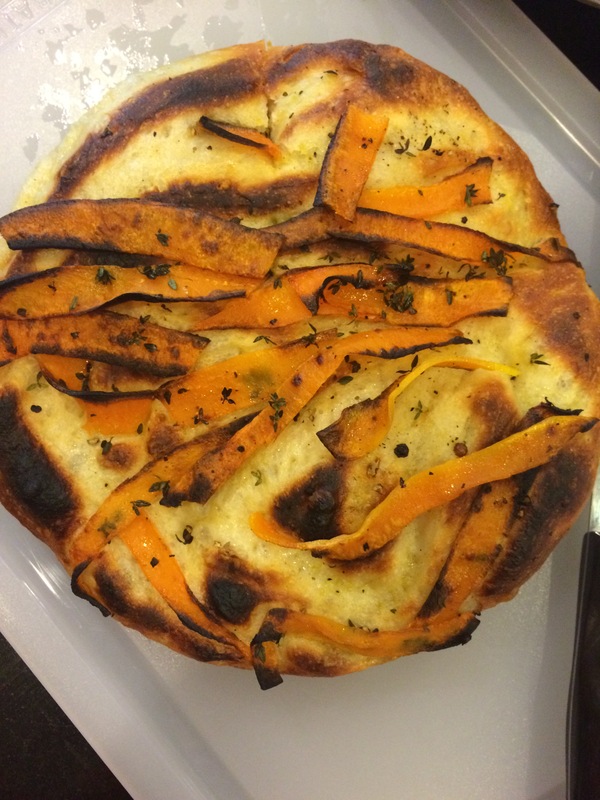 Spread squash evenly over top and push into dough.Let dough rest until slightly bubbly, 5 to 10 minutes. 6. PREPARE THE TOPPING Preheat the oven to 400°. In a large bowl, toss the squash with the 2 tablespoons of olive oil and season with salt and pepper. Spread the slices in a single layer on 2 large rimmed baking sheets and roast for about 15 minutes, until tender; let cool completely. Increase the oven temperature to 450°. 7. Gently curl the cooled squash slices and press them into the dough. Brush the focaccia with olive oil and bake for 25 to 30 minutes, until risen and browned on top. Transfer to a rack and let cool for 5 minutes.